The Village Vibe is Fernwood’s neighbourhood newspaper. It was created by Fernwood NRG staff and volunteers in 2005 to communicate with residents about goings on in the neighbourhood. 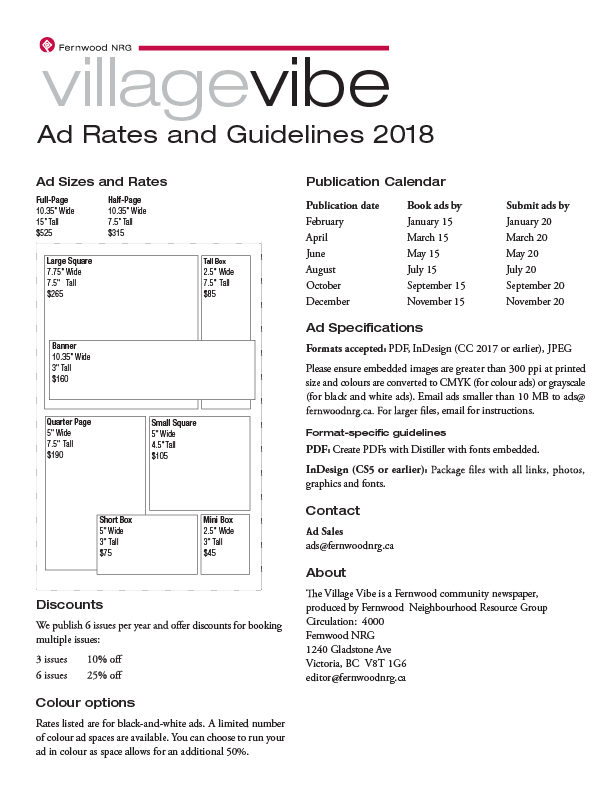 Published by Fernwood NRG, the Village Vibe is produced bi-monthly by an editorial committee comprised of Fernwood NRG staff, board members, contributors and neighbourhood residents. Articles, stories, poems, photos and original artwork are sourced from resident contributors. Advertisements are welcome—rates and specifications are available here. The Vibe is mailed out to all Fernwood households and distributed in boxes throughout the neighbourhood and at local cafes and shops.